Yesterday was Ada Lovelace Day 2014. Founded in 2009 by Suw Charman-Anderson, Ada Lovelace Day is “an international celebration of the achievements of women in science, technology, engineering and maths (STEM)”. The original idea was for people to write a blog post about a woman in STEM that they admire, and although the day has now evolved into a much larger celebration including live events (such as the excellent Ada Lovelace Day Live that I went to last night) the blog posts are still an integral part, so here is my (slightly late) contribution. Amy Mather (aka MiniGirlGeek) is a 15 year old computer programmer and STEM ambassador who I first met four or five years ago at a Manchester Girl Geek tea party. I was waiting to interview Lucie Green after her talk for the Jodcast but she was being inundated with questions from two kids who turned out to be Amy and her brother Dan. I joined in the conversation and was amazed by the questions Amy and Dan were coming up with and the level of their understanding of complex astrophysics concepts. They then kept popping up at science events in and around Manchester and we had great fun discussing everything in the Universe from the Sun to black holes! I haven’t had a chance to see Amy since I moved away from Manchester but I’ve been keeping up with her adventures by following her and her Mum on twitter. Despite my attempts to tempt her towards astronomy (! ), Amy has followed her passion for coding, and is probably best known for her work with Raspberry Pi doing all sorts of awesome and creative things. She’s given talks about what she does at the Raspberry Jamboree in Manchester and Wired Next Generation, been on Radio 4 and Newsround, and teaches other young people how to code. In November 2013 she was awarded Europe’s first-ever Digital Girl of the Year Award. I am constantly in awe at what Amy has managed to achieve already, and am convinced she is going to rule the world one day! During my PhD I quickly came to the realisation that I was never going to be a Vera Rubin or Henrietta Swan Leavitt. It was extremely unlikely that I would be known for my research and discover something that changed our understanding of the Universe. But if I can do something to encourage young people like Amy and Dan to be curious about the Universe they live in, if I can make young people realise that it’s OK to like studying STEM subjects, if I can help young people to decide that science is for them, then I think that’s a job well done. 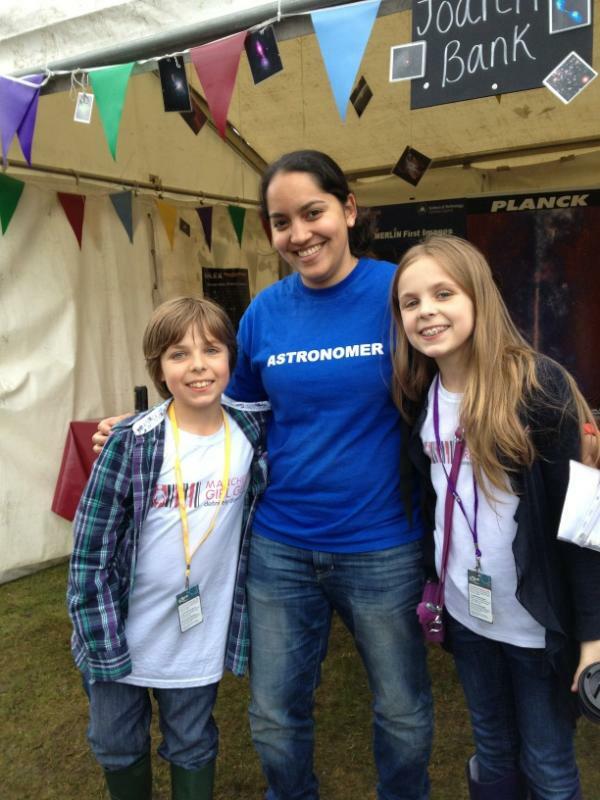 Me with Amy and Dan at Jodrell Bank Live in 2012. Stolen from @elsie_m_ on twitter.